Bingo! Farmyard fun for all the family! Stay entertained through the winter holidays with three oinking, clucking, barking animal games. 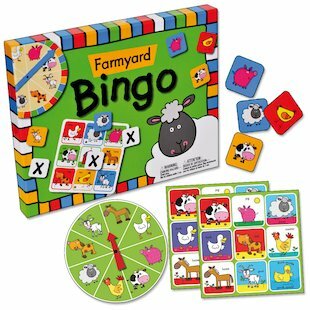 Designed for hours of excitement, and suitable for up to four players, this cute and cheerful set includes three different games – farmyard bingo, memory bingo and farmyard pairs. Perfect for chilly winter evenings, these simple games of luck and judgement will captivate children, building their skills as they try their hardest to win. Contents: 4 playboards, mini animal cards and a spinner, plus instructions and ideas for extending or simplifying play for different age groups.